Woo Hoo! Slugfest II, here I come! But wait, this year it’s called the Anilao Nudibranch Festival. Boring. I guess the Filipinos were showing up at Crystal Blue Dive Resort last year looking for a basketball tournament. “Slug” means a basket in Filipino basketball terms. Lame. I am super excited! I brought a gavel for Dave Behrens. He is one of the only few Nudibranch Scientists who can discover and name new nudis. We often get into big debates on these trips about the identification of the nudibranchs and then we have to go to NUDI COUNCIL. This consists of each of us making our argument for the ID of the nudi and then Dave making a ruling on it. I figured he needed an official gavel. 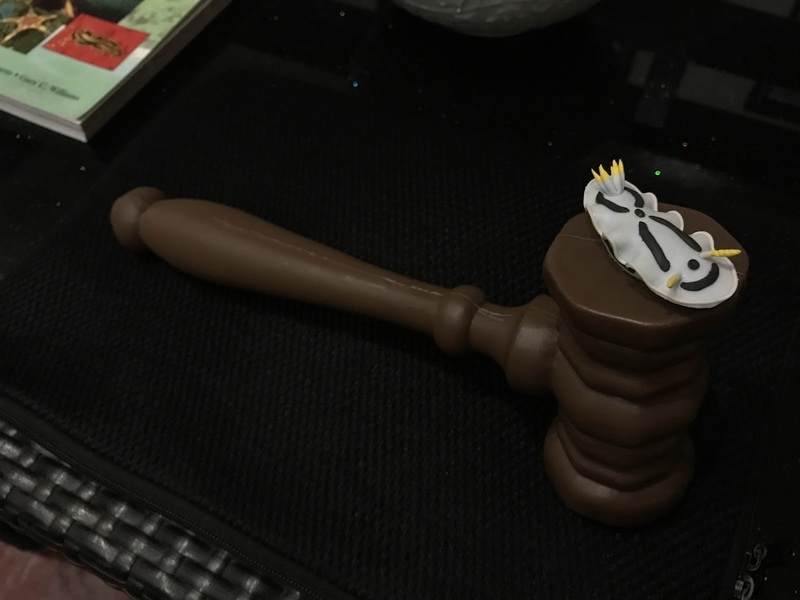 So I ordered some nudibranch magnets and I glued one on the gavel. Now he can rule nudi council in style. The nudi I glued on is one that he named: Goniobranchus dianae, after his (now) ex-wife. Unfortunately, that was the only one available on the website that he discovered. I also brought a nudibranch sarong for Pirjot from Red Bubble, just like mine. We can have matching ones! I know about 50% of the people who will be on this 10 day festival. My flights were very easy over to Manila. I got in late and only spent one night in the local hotel.